Another ‘Catastrophe’ for US Navy – USS McCain limps into Singapore – Coercion Code – "Dark Times are upon us"
US Defence Secretary Jim Mattis announced a pause in operations of the fleet so officials can take a deeper look at its performance, including personnel, navigation capabilities, maintenance, equipment, surface warfare training, munitions, certifications and how sailors move through their careers. Navy Admiral John Richardson later clarified in a Twitter post that the review would include the possibility of ‘cyber intrusion’ or sabotage, although there were “no indications right now”. “But review will consider all possibilities,” he said. 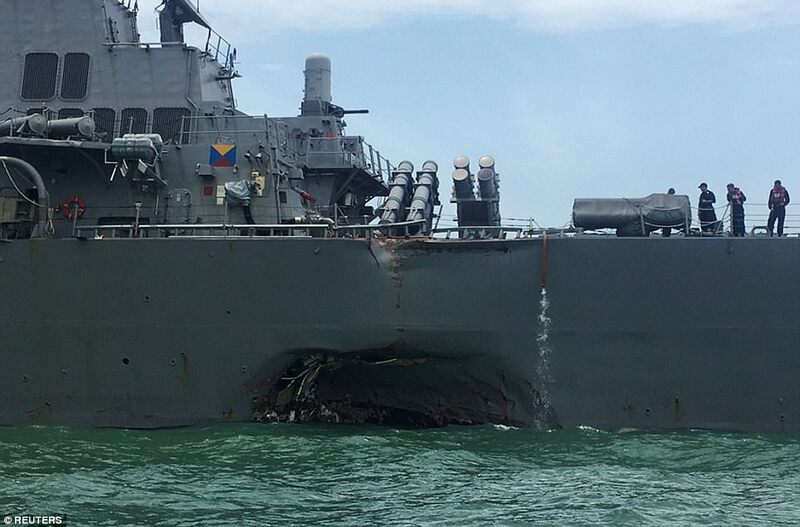 Speculation has been building that the USS McCain was hacked ever since news broke about the collision. Itay Glick, founder of cyber security firm Votiro said he had immediately become interested in the potential for cyber interference when he heard about the accident yesterday. “I don’t believe in coincidence,” Mr Glick told news.com.au. Mr Glick worked in the cyber-warfare unit of the Israeli intelligence agency for seven years and he believes countries like Russia and China may have the capability to launch an attack on the warships. “China has capabilities, maybe they are trying things, it is possible,” he said. He believes there are two main ways the warship could have been interfered with, including an attack on its GPS that impacted its navigation, or a malware attack on its computer network that gave it incorrect information which may stopped it from seeing the tanker. Some have dismissed the idea the warship could have been subjected to a GPS spoof as unlikely, because the signal would have to be wide enough to affect dozens, if not hundreds of ships in the region. But Mr Glick said there had already been evidence of this type of technology being used to set at least 20 ships off track in the Black Sea near Russia, and experts have speculated there is potential for it to be isolated to just one target. “There is already a lot of interest in cyber protection of cars and autonomous vehicles, we can deduce from that, there might be a way to control ships and airplanes,” Mr Glick said. While investigation of the USS Fitzgerald’s collision in June has not been completed, it has already pointed to some human error. The captain has since been relieved of his command and other sailors were punished after the Navy found poor seamanship and flaws in keeping watch contributed to the collision. But Mr Glick said unless the warships were at a high readiness level, they were probably relying more on the computer for navigation than on human eyes. “Blaming a human is often easier than considering the possibility of a cyber attack,” he said. He believes the latest collision strengthens the case for the possibility of cyber espionage. The USS McCain had been heading to Singapore on a routine port visit after conducting a sensitive freedom-of-navigation operation last week by sailing near one of China’s man-made islands in the South China Sea. The accident happened at the start of a designated sea lane for ships sailing into the Singapore Strait, one of the world’s busiest. 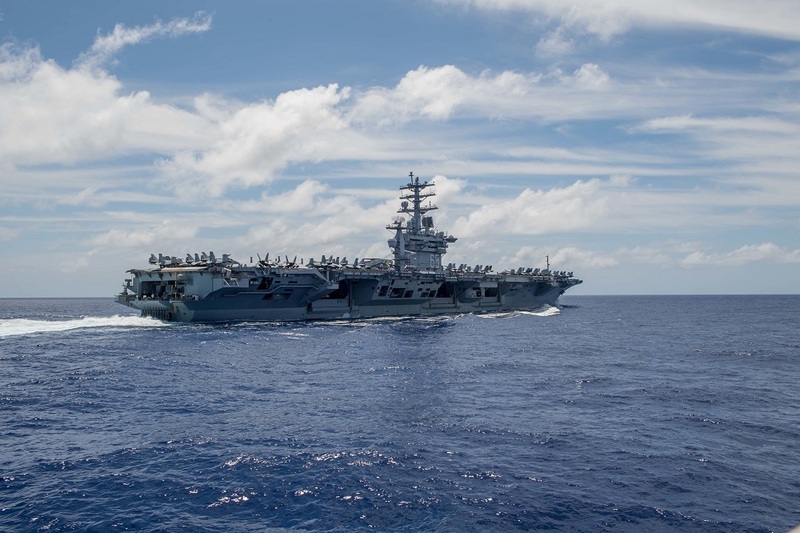 Admiral Richardson, the chief of naval operations, said the comprehensive review of the 7th Fleet would look at operational tempo and trends in personnel, matériel, maintenance and equipment. Adm. Richardson wants to ensure there aren’t bigger problems in the fleet that may be masked by the high pace of operations and budget uncertainties, according to a Navy official. He has directed Admiral Phil Davidson, head of the Navy’s Fleet Forces, to lead the investigation. “This review will be on a very tight timetable,” Richardson said. David Hodges publicly stated, on June 21, that the USS Fitzgerald was hit by an EMP. His belief is rooted in several factors which will be discussed by the end of the article. However, the foundation for my belief comes from a two-year-old declassified intelligence report. A 2015 declassified intelligence report, obtained by the private National Security Archive, provides details on China’s EMP weapons as well as the plans for their use. The report details how much of China’s military is developing EMP weapons that the Chinese plan to use against targeted U.S. aircraft carriers with regard to any future conflict over Taiwan. Parts of the National Ground Intelligence Center study on the lethal effects of electromagnetic pulse (EMP) and high-powered microwave (HPM) weapons revealed that the arms are part of what China refers to as the “assassin’s mace”. This arsenal of EMP weapons allows a technologically inferior China to defeat U.S. military forces while leaving much of the surrounding infrastructure intact. It is like the neutron bomb of EMP weaponry. The report further states “For use against Taiwan, China could detonate at a much lower altitude (30 to 40 kilometers) … to confine the EMP effects to Taiwan and its immediate vicinity and minimize damage to electronics on the mainland.” After I aired my opinion that the Fitzgerald was hit by an EMP, I heard from an old reliable deep cover source, as well as a new source, in which both sourcesstated pretty much the same story. The Fitzgerald was hit with a Chinese based EMP and that the new generation of Chinese EMP weaponry is capable of targeting a select area and take down a tank, a plane or a ship without damaging surrounding electronics. Both sources and the once labeled “top secret ” report, revealed that Chinese military writings have emphasized the importance of building low-yield EMP warheads. The report said that future Chinese EMP weapons should emphasize developing “any low-yield strategic nuclear warhead (or tactical nuclear warheads) could be used with similar effects. The DF-21 medium-range ballistic missile was prominently mentioned as a platform for the EMP attack against a country such as Taiwan”. Of course, this strategy has definitive applicability in its use against the United States. According to the report, this “trump card” or “assassin’s mace” weapons that are based on new technology, has been developed in high secrecy. Trump card would be applicable if the Chinese have developed new low-yield, possibly enhanced, EMP warheads, while assassin’s mace would apply if older warheads are employed, the report said. But as stated, individual aircraft carriers would be prime targets for the newest generation of Chinese EMP weapons. Americans have been told by our corporate controlled media that EMP weapons will have no impact on human beings. These reports are a bold faced lie as this same report went on to detail how the Chinese have conducted EMP tests on mice, rats, rabbits, dogs and monkeys. The results of the mammal directed EMP test results produced eye, brain, bone marrow and other significant organ injuries. It stated that “it is clear the real purpose of the Chinese medical experiments is to learn the potential human effects of exposure to powerful EMP and high-powered microwave radiation.” The report also concluded that these human based EMP tests may have been conducted to determine safety or shielding standards for military personnel or weapons. In conclusion, with regard to this exotic weaponry, it is clear that the Chinese plan for nuclear EMP strikes against the United States are part of Chinese military doctrine and there is also evidence that China has already developed a set of super-EMP nuclear weapons that produce powerful EMP fields, but with EMP related effects that can be contained to specific geographic locations. There is no doubt that the Chinese are perfecting task-specific EMP weapons to a degree that is now known outside of classified circles. After speaking to my sources and reviewing the previously classified report, I have no doubt that is what the Fitzgerald was hit with. 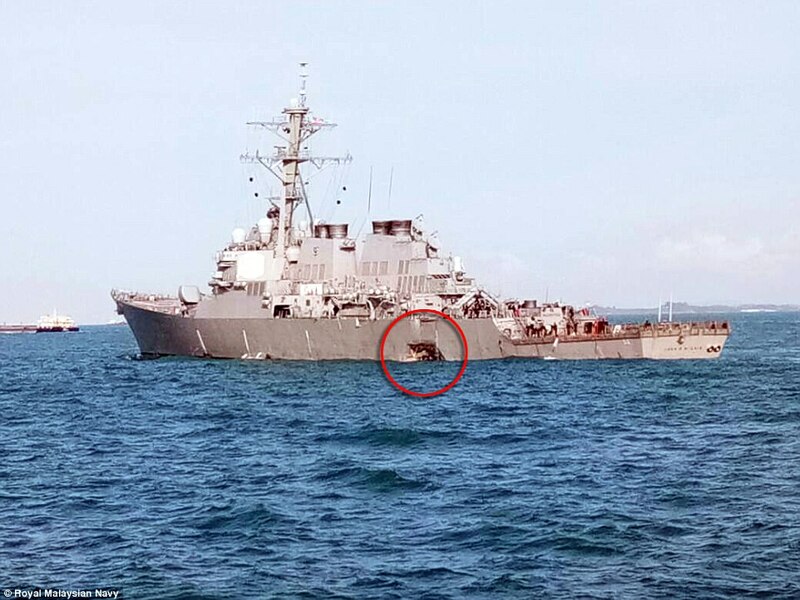 The US Navy has presented a scenario in which we asked to believe the highly improbable scenario in which the Fitzgerald was accidentally struck by a cargo ship. This bold faced lie could only be true if the crews of both ships simultaneously had an electronic failure resulting in radar and sonar malfunctions and the lookouts of both ship simultaneously went to sleep. The Navy cover story is simply not believable. Why Would China Perpetrate Such an Attack? 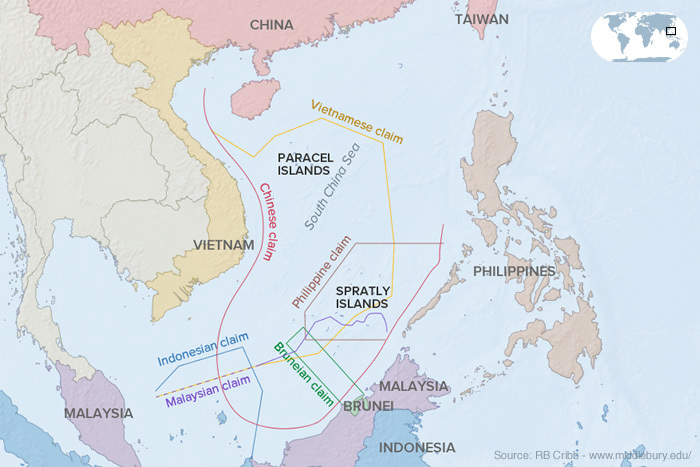 Previously, China has issued stern warnings to the US Navy to avoid the South China Sea. On multiple occasions, the ships from the US Navy have mocked the warning by sailing into the area. This time, the Chinese mean business. China just delivered a message to the United States government that they will not tolerate any more US Navy incursions into the South China Sea. The irresistible force meets the immovable object. Disrupt any resurrection of the TPP so no nation gains an economic advantage over China in its own backyard. Isolate Taiwan geographically and militarily. Closing down the South China Sea moves China in the direction of accomplishing this kind of action. The short-term goal is to economically diminish Taiwan. The final goal is the take-over of Taiwan. 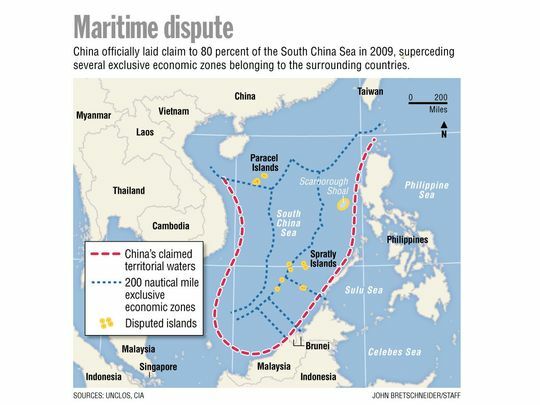 China is increasingly aggressive, almost to the point of forming a quasi-naval blockade in and around the disputed territories which are a point of disagreement between China, her neighbors and the United States. In fact, China’s actions within the last few days are clearly indicative of a nation determined to defend its claims, just ask the seven dead sailors from the Fitzgerald. The attack upon the Fitzgerald was a clear warning that the Chinese are capable of defending the South China Sea. From the Chinese perspective, the Fitzgerald may very well have been an aircraft carrier, like the Nimitz. Speaking of the Nimitz, the US is not to be deterred. The Nimitz is sailing to the area where the Fitzgerald was attacked. Will the Nimitz task force enter the South China Sea and dare the Chinese to start World War III? Please take a look at the following maps. It is clear that the Nimitz could easily turn South as the US calls out the dogs of war.